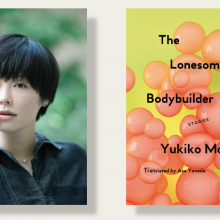 Yukiko Motoya’s English-language debut, The Lonesome Bodybuilder, translated by Asa Yoneda, features characters that move in and out of surreal circumstances as if wandering through different rooms of a house. In the story ‘The Straw Husband,’ a woman is married to a man made of straw who, after becoming upset with her, begins to spew miniature orchestral instruments—timpani, clarinets, snare drums—from his body, until he’s left deflated and unconscious. This is just one of several of Motoya’s stories that examine relationships, especially marriage between a man and a woman, with an absurdist lens. But we can still recognize the discord and unruliness of human emotions; the story unfolds with a kind of quiet violence often found in the domestic realm.